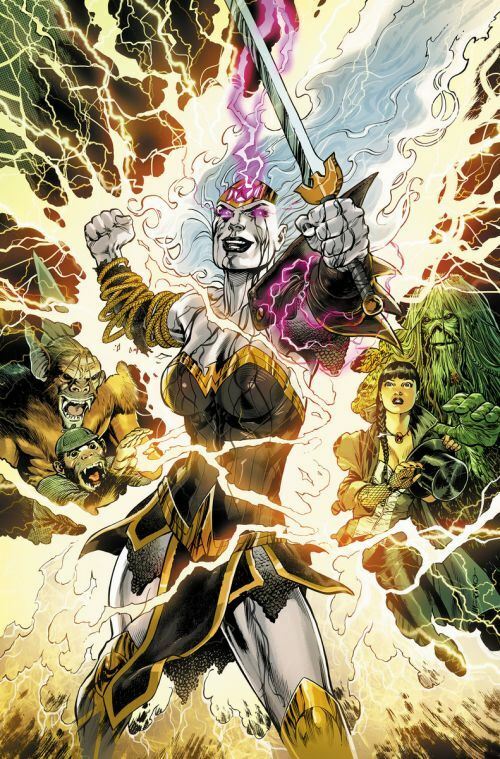 The Witching Hour is the start of a crossover storyline that leads into both Wonder Woman and Justice League Dark. Considering that the Amazon has appeared in the first three issues of the team book, that’s not very daring of a crossover, but I am not about to complain about that. This is all just too darn good. I have loved the first three issues of Justice League Dark, and the Witching Hour follows immediately on them, with the team having just faced the Upside Down Man. Wonder Woman, it turns out, was marked by Hecate, the triple goddess of witches, as a child. Now, Hecate is making a power play, and using those she has selected over the years. The story is much more in the tone of Justice League Dark than of Wonder Woman. There are a few cameos by some minor magical characters, who don’t fare so well. Some horrifying moments, and a few dashes of weird comedy. I love Swamp Thing’s body mulch. And I also love the way the main League get sidelined, without even being aware of it. The well crafted tale is beautifully brought to life by Jesus Merino. His art really brings out the drama and the horror, and you gotta love anyone who can render Detective Chimp this well. Given the title of this book, I was really hoping to see the Three Witches, the hosts of the identically titled horror anthology from the 70s. No such luck, but I am still waiting to see if they show up later in the crossover tale. If you enjoy Justice League Dark, you cannot miss this story. If you haven’t been reading Justice League Dark, you really ought to be, and should probably pick this up, and the first three issues, before you get too far behind.